I like search something online if I want buy or download something, you will have more choices and compare to different features or prices. I really want someone make a website that can review products for you in one place, it should be nice. Top Ten Reviews is a that kind site, it has different categories and channels: Software, Web Services, Hardware, Movies, Music, and Video Games. 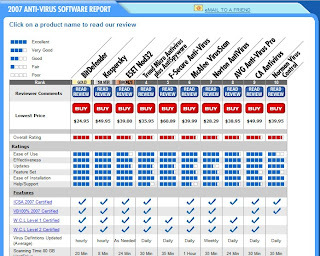 The review is very professional, and tells you top ten product's detail including: name, rank, rating, feature, price. It is very useful site.